Michal Meron was born in Haifa, Israel and received her education and training as an artist in Vienna (Austria) and in Israel at the Tel Hai Art College. 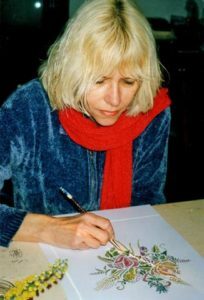 Michal has exhibited her works in Europe and the United States of America in Jewish Museums, institutions and public and private galleries. Throughout the last decade, Michal Meron’s works of art can be found all over the world. Her Haggadah has been published in Hebrew, English, French and Spanish and it is a welcome addition to many Jewish homes annually bringing delight to adults and the young alike. Her last publication “The Illustrated Torah” represents all 54 Sidrot and Haftarot from the Torah. Her passion for Jewish themes stems from an avid interest in Jewish teachings and according to her personal creed, everything that comes from Jewish lore can be transformed into an artistic interpretation. Several Jewish Museums of Europe have commissioned Michal Meron to create a series of paintings showing Jewish scenes within European Synagogues. The Studio in Old Jaffa is proud to present this new collection. The first group includes Amsterdam, Florence, Frankfurt, Prague, Rome, Venice, Vienna, and Worms. If you wish to receive further information on these or other works of art by Michal Meron, or on past and present exhibitions of her works, please do not hesitate to contact us via our contact page.